Turkish Leopard 2 tanks are actively operating in the war in Syria. 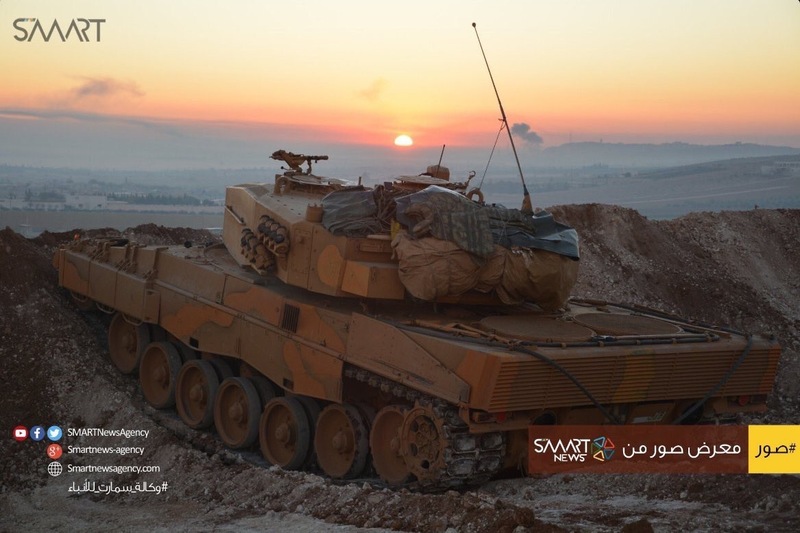 The tanks have been photographed at different locations near the town of Al Bab, which is located about 35 kilometres (21.7 miles) north-eastern of Aleppo. A few photos were shared on Twitter, apparently taken by Turkish soldiers. More detailed photos and video footage was provided by the SMART news agency, which is said to have ties to Syrian rebels. The Turkish Army is operating the Leopard 2 main battle tank (MBT) since 2005, when an initial batch of 298 Leopard 2 tanks was ordered. A further 56 tanks were purchased in 2010 and 2013. The Turkish military previoulsy tested the Leopard 2 Improved (Leopard 2A5/6 prototype), the Leclerc with additional armor package, the Ukrainian T-84-120 Yatagan tank (a version of the T-84 fitted with 120 mm gun and bustle-mounted autoloader) aswell as the M1A2 Abrams fitted with the MT883 diesel engine (as the gas turbine proved to be a main issue for potential buyers). The Leopard 2 Improved performed best, however the Turkish government didn't purchase the tanks in the originally planned volume and version (up to a thousand Leopard 2A5 tanks were wanted by the military). Instead the Turkish goverment favored the local production of MBTs, where the bid by the South-Korean company Hyundai-Rotem was chosen over Krauss-Maffei Wegmann's offer, because it included the full transfer of technology instead being a licence production agreement. This lead to the Altay main battle tank, based on South-Korean technology used on the K2 Black Panther MBT. 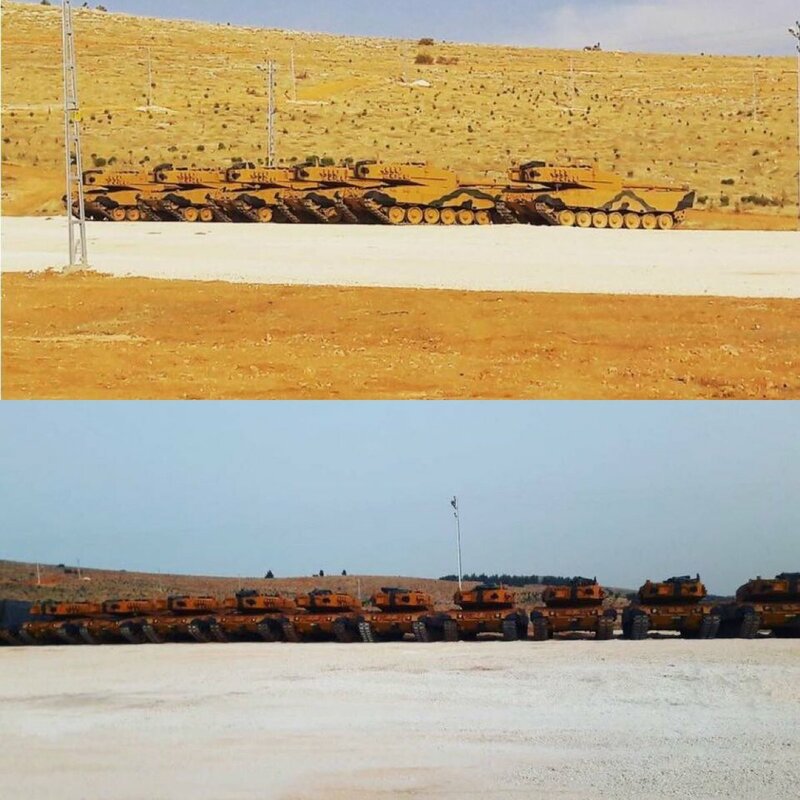 The Turkish Army has been operating the M60 tank and the upgraded M60T Sabra in Syria since a few months already. The Leopard 1 and Leopard 2 tanks were held back, despite offering a few key advantages over the other tanks. The reason for this is that the Turkish purchase of the Leopard 2 was very controversial in Germany, Turkey even had to sign an agreement permitting the usage of the tanks for other tasks than pure self-defence. As revealed in an interview with the Turkish journalist and military expert Mete Sohtaoğlu by the German BILD magazine, the agreement on cooperation between the two countries in 2009 gave the Turkish Army the permission to use the Leopard 2 tanks in combat. It seems possible that this permission was still limited to operations in Turkey only and the Turkish Army was allowed to use the Leopard 2 in Syria just a few months ago. The exact number of Leopard 2 tanks being used in combat is currently still unknown. 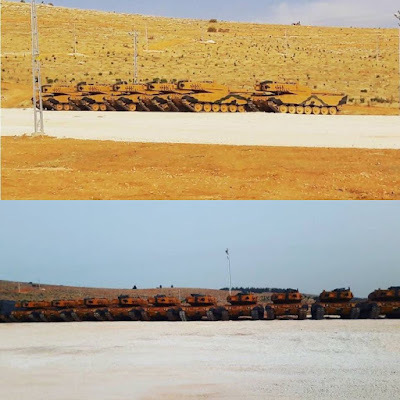 However photographs show that there are at least eleven tanks painted in the new desert camouflage scheme, suggesting that at least a full company of tanks is operational in Syria. It has been claimed that the Turkish tanks operate in platoons of three tanks, which is rather unique as most tank platoons consist of four or even five tanks. According to a Spanish blogger, 18 Leopard 2A4 tanks arrived in Syria at the 8th December 2016, followed by a further 25 tanks arriving two days later. This information is apparently based on various photographs of tanks being transported to the border. If correct, this means that there is most likely a complete Leopard 2 tank battalion deployed in Syria or to the Syrian border region. In one incident a tank was apparently hit by an anti-tank guided missile (ATGM). The Leopard 2 was in a hull-down position, the hull being located behind a large heap of ground. The missile hit the turret section of the tank, it is not known if it was penetrated or not. The missile that hit the MBT is supposedly an US-made TOW-2A ATGM. Rumors are conflicting on what happened to the tank: some sources claim that the tank's armor was not penetrated, other suggest that the armor was penetrated, but noone died due to the ammunition not being incinerated by the spall. In a further incident two further Leopard 2 MBTs were attacked with ATGMs. The enemies attacked the tanks from behind the Turkish lines, launching the missiles at the sides and rear of the tanks. A first ATGM disabled the tank closest to the camera, but no ammunition was set on fire - this means that even if the ATGM managed to penetrate the tank's armor, there is a rather high probability that not all crew members died, but were only injured. On a tank without separated ammunition storage in the turret, such as the Italian Ariete MBT or different versions of the T-72 and T-80, a penetration at this spot could lead to the death of the whole crew. The second tank was apparently hit from diagonal from behind, hitting the turret bustle. It was hit after the first tank already took an ATGM to it's turret, the crew apparently was completely ignoring this fact. The tank did not try to secure the flank from which the enemy ATGMs were launched, something that should have been done after the first missile hitting. The missile set either the hydraulic systems or the turret ammunition on fire, leading to a visible blast and flames. In the Leopard 2 the turret hydraulics and the turret ammunition are located in separate compartments, which are isolated from the crew. So in theory there still is no proof that the crew compartment was penetrated - the crew might have survived with no or little injuries only. However when being hit by a powerful ATGM from behind (which could lead to a penetration of the compartment walls/door) or when the door of the ammunition compartment is open, the detonation could also kill the crew. It is not known if any Turkish soldiers died in any of the three Leopard 2 tanks hit by ATGMs. A big issue with the Turkish Leopard 2 tanks is the fact that they are outdated, they are not designed to resist currently available ATGMs and their armor is completely focused on protecting the frontal arc. It is not clear which armor package is fitted to the Turkish Leopard 2A4. While the late production Leopard 2A4 tanks received stronger armor inserts, all older production models were converted to the Leopard 2A4 configuration - without changing the armor composition! In fact even a few of the newly built Leopard 2A4 tanks were built with one of the older armor packages. 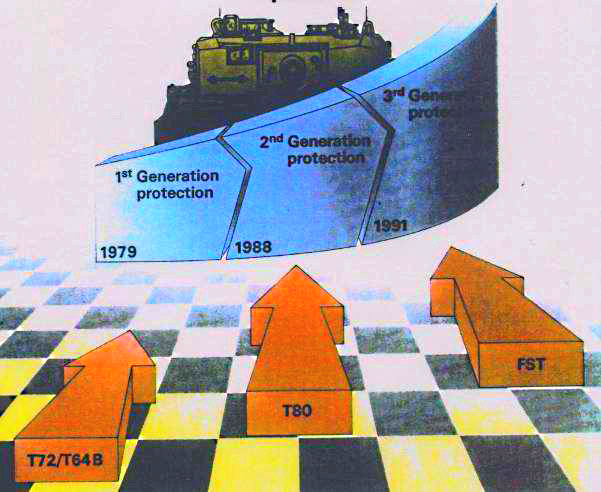 Between 1979 and 1992 (the time were the Leopard 2 tank was series produced in Germany) three different generations of armor were used. It is not known if these are identical with single armor packages or mutliple different armor packages were used within a "technology generation". The first generation armor was introduced in 1979, while the second generation armor (1988) and third generation armor (1991) were exlusively used on Leopard 2A4 tanks. More modern armor packages were introduced in the German Army variants in the late 1990s with the Leopard 2A5/2A6 and in 2014 with the Leopard 2A7. 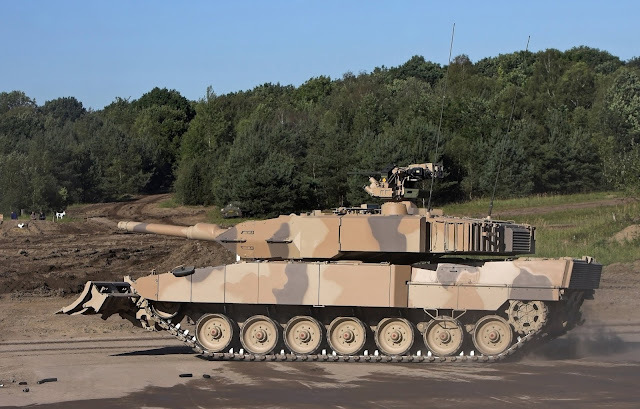 Furthermore a number of companies such as Krauss-Maffei Wegmann (KMW), Rheinmetall/IBD Deisenroth and RUAG are offering armor upgrades beyond the current Leopard 2A7, usually by mounting external armor modules at the front, sides, rear and roof. 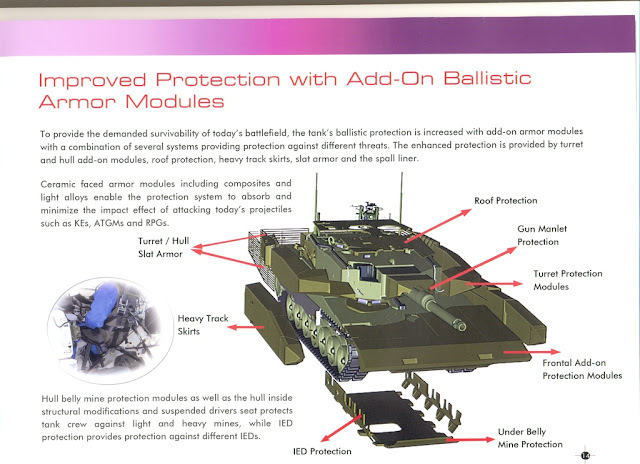 The protection can also be enhanced by adding a new softkill or hardkill active protection systems (APS). The MUSS softkill system has been tested on the Leopard 2 in 2003 and has been fielded on the Puma IFV. It is capable of jamming most missile systems and automatically hiding the tank behind a multi-spectral cloud of smoke, generated by firing special smoke grenade dischargers. Why does this matter? Because the Turkish Leopard 2 tanks are older models upgraded to the 2A4 variant (easy to identify thanks to the old ammunition hatch) and not newer production vehicles, which were built with better armor packages. While KMW does offer upgrading the armor inserts to a newer generation - or at least the company did offer this option in the past - there are no reports about the Turkish Leopard 2A4 tanks being upgraded. As the Turkish Army wanted and tested the Leopard 2 Improved, it seems most likely that the original plan saw the upgrade of all purchased Leopard 2A4s to the Leopard 2A6 configuration at a later point of time, a plan probably stopped in favour of the Altay development. Turkey might attempt to push the Leopard 2NG into service. The Leopard 2NG (Next Generation) is an upgrade developed as a private venture by the Turkish company Aselsan with a number of partners. While this upgrade replaces the optroncis and fire control system, it also includes new electric gun and turret drives, a remote wepaon station (RWS) and a new fire supression system. The Leopard 2NG is also using IBD's AMAP armor package for enhanced protection against anti-tank ammunition, missiles, mines and improvised explosive devices. More important than the technology used on a tank might be the tactics on how the tank is being used. The Turkish Leopard 2 tanks seem to be poorly employed, sitting always behind heaps of ground in a hull-down position. While a hull-down position is favourable in certain situations - such as symmetric warfare when the direction from which the enemy will approach is known - it is not a good idea for the tanks to remain in a static position without proper protection, when they can be attacked from the side and rear aswell. In the incident where two tanks were hit, the crew of the second tank was apparently not reacting at all - they simply ignored that the other Leopard 2 has been hit by an ATGM some time ago, the crew apparetnly didn't care about taking out the enemy ATGM team. When using tanks in a static emplacement just for fire support, one should expect them to be used in a secured perimeter. If the tanks are not capable of securing the area by themselves, then infantry or other combat vehicles should take over the task. Surveillance and reconnaisance vehicles with thermal imagers should have no issues detecting enemy ATGM teams and infantry even at long distances. The Turkish Army doesn't seem to employ the tanks as part of a combined arms doctrine - tanks are always seen operating alone and not together with (mechanized or motorized) infantry. Instead the Leopard 2 tanks seem to play sitting ducks and serve as more expensive artillery replacement... a cheap 120 mm mortar carrier vehicle would probably be better suited for this job. Great article as always, keep up the good work. It is curious to find a modern day army that isn't using combined arms warfare. I thought the folly of sending tanks out with no infantry support was proven in the WWII? Losing tanks in Syria is secondary issue. Public is strictly against losing any soldiers in Syria that is primary problem for Turkish army. So Soldiers are keep behind the line. Fsa and Tanks has been separately attacking ISIS targets. So Turkish army lost only a few Soldiers in 3 month while Fsa's and Tank divisions lost are much higher. According to Defense news the ISIS has use Fagot or Konkurs ATGM which these missile destroy the 2 Turkish Leopard 2. But the good news, these weapon are Soviet era stuff which produced since Cold-War. How is that be a good news? If even a 21st Reinforced armour vehicle is incapable against cold-war era anti-tank vechile, how u can rely it againt more sophisticated threat? Based on a more extensive set of stills of the first Leo hit (from the front-ish) it looks like the missile struck the front roof plate, not the main body of the composite armour on the turret cheeks. So armour comp is somewhat of a moot point in that case. What strikes me as odd is how static those tanks were... if you're going to go to the trouble of building a berm or a fighting pit, might just as well make it a proper *turret down* position. Observe from there, then move to hull down only to fire, exposing your position for only a few seconds. Come on guys, its in FM 15-17! My name is David Axe. I am the editor of War Is Boring, a popular military news blog. www.warisboring.com. We love Below the Turret Ring. We'd like to discuss a possible partnership with you. Please email me at david.t.axe@gmail.com. Thanks! On what fact is based the presumption that the Turkish 2A4's are not in the 2A4 specification? The 1st image doesn't show a Leo2. The Leo2 doesn't have optics on top of the turret and the cheeks are not hat wide either. Looks more like a M1 turret, but it could really be anything. I think it's an RV from 7 o'clock. THE TURKISH ARMY LOST 5 LEOPARD2 IN SYRIA TOTAL LOST AND 6 WERE HIT. THEY ARE STUPID BECAUSE THEY COULD BUY THE TROPHY SYSTEM FROM ISRAEL AND SAVE THE LIFE OF THE SOLDIERS AND THE TANKS . TURKEY COULD ALSO BUY THE LAST MERKAVA 4 TANKS THAT WERE SECURE AND PROVEN IN WAR. THE USA JUST BOUGHT 300 MERKAVA4 WITH TROPHY SYSTEM FROM ISRAEL AND 10000 AMERICAN ABRAMS A1 AND A2 WILL HAVE THE TROPHY 2 SYSTEM .THE USA WILL USE TH TROPHY FOR THEIR A3 SYSTEM AND UFV ALSO.EVEN RUSSIAN AND INDIA BOUGHT EACH 1000 UNIT FOR THE T90MS.RUSSIA WILL BUY 5000 PCS FOR THE T14 AND T80 ALSO.FRANCE BOUGHT 300 PCS FOR THEIR NEW TANKS.GERMANY BOUGHT HUNDREDS OF PCS FOR THEIR TANKS. AND THE UK BOUGHT HUNDREDS FOR THEIR TANKS.WHY TURKEY WANT TO LOSE ALL THEIR TANKS .EVEN KOREA AND JAPAN BOUGHT THIS WEEK THIS SYSTEM AND SAUDI ARABIA AND THE UAE ALSO. I LIKE YOUR BLOG THANK YOU.